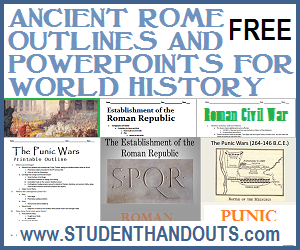 Here they are, the most popular powerpoints and outlines on the dot-com for teaching the history of ancient Rome to high school students. The materials are divided into four periods: the Roman Republic, the Punic Wars, the Roman Civil War, and the rise and fall of the Roman Empire. (The materials on the barbarian invasions which took place during and after Rome's fall technically belong in the next section, but we digress.) For more of our free educational materials on ancient Rome, click here.